Vijay Ratnakar Gutte, the director of upcoming Anupam Kher starrer The Accidental Prime Minister, has been arrested for alleged Goods and Services Tax fraud to the tune of Rs 34 crore. Gutte’s firm VRG Digital Corp Pvt Ltd, has been accused of taking “fake invoices” involving GST of Rs 34 crore for animation and manpower services received from Horizon Outsource Solutions Pvt Ltd, a company that has come under the scanner of the government agency for GST fraud of over Rs 170 crore, Indian Express reported. VRG Digital Corp has also wrongly claimed a cash refund of Rs 28 crore from the government against CENVAT (Central Value Added Tax) credit received for these fake invoices since July 2017, the IE report said citing court documents. So far, Gutte has produced three films- Emotional Attyachar, Time Bara Vait and Badmashiyaan. A Mumbai court has sent Vijay Gutte to judicial custody at Arthur Road jail till August 14. 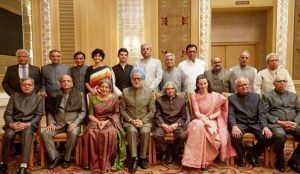 The Accidental Prime Minister’, which is a reel adaptation of Sanjay Baru’s book of same name, has Anupam Kher as Prime Minister Manmohan Singh and Akshaye Khanna as Singh’s media advisor, Baru. It is scheduled to release in December. Gutte’s arrest comes at a time when his father Ratnakar Gutte’s firms are facing allegations of Rs 5,500 crore bank fraud. Leader of Opposition in the Legislative Council Dhananjay Munde, on July 17, alleged that Ratnakar Gutte’s eight firms had collectively defrauded various banks of over Rs 5500 crore, and that the Maharashtra government was shying away from arresting him despite several offences registered against him.